With the exception of Mary, the mother of Jesus, few women are more honored in Scripture than Mary Magdalene. She was at Jesus' side at the Cross, and was named as the first witness to the Resurrection in five different accounts found in the four Gospels. 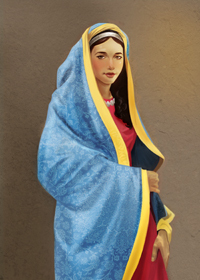 Mary was one of many who helped support Jesus and his Apostles during Jesus' ministry (Luke 8:3).